Recordings made by the Romanian singer between 1936 and 1939, most in Bucharest, accompanied by various ensembles of violins, bass, cimbalom, cobza, accordion, clarinet, etc. All the songs on this CD were cut between 1936 and 1939, mostly in the summer and autumn of 1939. The first studio recordings by the Lifa Company were mainly composed of folk-songs which until that moment Maria Tanase, standing on the threshold of a great career at that time, had only sung in the company of her closest friends. Later in the Columbia studio on the Strada Udricani, Maria Tanase, together with Mitica Matsa's ensemble, cut recordings of the "Mahala" song about a gypsy wedding, "Nunta Tiganeasca" and a version of "Cine iubeste si lasa". Likewise, in 1936 she recorded a first version of "Invirtita de pe Tirnava". Maria Tanase recorded her next works, which also included a romantic song and two tangos (see "Tango alla Romanesque" Oriente RIENCD40), in the autumn of 1936 with Heinz Sandauer's orchestra at the Columbia studio in Vienna. On her radio debut in February 1938 she brought Ion Matache's ensemble with her into the studio. The formation of the violinist, Ion Matache, at that time included two violists, a double-bassist, a cymbalist and a cobza player. On later recordings she was accompanied by Constantin Bugeanu's ensemble on accordion and clarinet, e.g. on "Si-ar fi batut Dumnezeu". At that time Maria Tanase did not have a fixed ensemble. According to the occasion and venue, in addition to the ensembles already mentioned, those of the violinists Petrica Motoi, Ilie Radulescu, Victor Predescu and Costica Tandin were engaged. Ilie Radulescu's band originated from the south Romanian town of Pitesti which, together with Arges, was one of the centres of Romanian "Lautari" music at that time. Maria Tanase also had her first successes with Ilie Radulescu's troop on the stage of the Alhambra revue theatre as an interpreter of folk-songs and couplets written in the spirit of Romanian songs. In 1938 Maria Tanase could be heard singing with Petrica Motoi's ensemble in the Luxandra restaurant, where she appeared every evening to perform folk and gypsy songs after completing her other concert obligations. A Lautari song popular in the Thirties and which was heard in the beer gardens and luxury restaurants of the time. A young girl is led away by a policeman and she tries to bewitch him, but clearly without any success. Recorded in 1939 with Mitica Matsa's ensemble for Columbia in Bucharest. A hora from the Bucharest suburbs, a dance piece which was included in the Lautari's repertoire in the period between the wars and played in the beer gardens known as "Carciuma", but also for a more refined audience in the nobler establishments located around the Calea Victoriei and Cismigiu Park. Part of the lyric runs thus: "She looked at me with such anger, as if I had never loved her ..."
The hora occupies a central position in the folklore and rural culture of Romania. This is how the transition from the world of childhood to adulthood is manifested through participation in a communal group dance. But the hora also symbolises the course of the stars, the sun and life itself. The highpoint of the festive occasions in people's lives is the wedding, and it is here, after the church ceremony, that the newly-weds dance the "Hora Miresei", a ritual hora which takes the couple into a new part of their lives. Recorded in 1939 with Costica Tandin's ensemble for Columbia in Bucharest. A version of a well-known song with a melancholy lyric revised by Tanase, which bears the characteristic traits of a doina. Arrangement: Maria Tanase. Recorded in 1939 with Costica Tandin's ensemble for Columbia in Bucharest. A hora from the South Romanian provincial town of Mizil which lies at the foot of the mountains. Ibovnic is a term for beloved or sweetheart which is hardly ever still used in Romania today. An old song from the repertoire of the Lautari, the gypsy musicians from South Romania. Maria Tanase later recorded this vibrant hora again in another arrangement for Electrecord (see "Malédiction d'Amour", Oriente RIENCD22). But in this first version Maria Tanase has already developed a very expressive interpretation of this song, which sounds extremely oriental on account of its melody. This dancing song from Transylvania, which is also known under the title "Tataise si-o cumnata", is made up from different lyrical subjects from various regions of Romania, from Banat, Transylvania and from the central part of Moldavia. The Tirnave is a river in Transylvania. A song from the suburbs of Bucharest known as "Mahala", which Maria Tanase learnt from her uncle and which was one of the first works from her repertoire to be cut for a record company. This gloomy love song from Transylvania has accompanied Maria Tanase throughout her whole life. A version sung in French, recorded in 1957 for Electrecord, can be found on the CD "Malédiction d'Amour", Oriente RIENCD22. Recorded in 1936 with Costica Vraciu's ensemble for Columbia in Bucharest. This "boasting song" originates from the Maramuresch and there again possibly from the most northerly tip of the country, the region of Oas, an enchanted land rich in forests which, both in terms of landscape and culture, forms part of the Carpathian forest areas. The origins of the song can also be detected from the dialect which has a North Moldavian flavour and which Maria Tanase imitates so wonderfully here. An emotional doina with the traits of a didactic poem. "Muieri" is an antiquated term for women or females. Recorded in 1939 with Ilie Radulescu's ensemble for Columbia in Bucharest. A vibrant hora from the south of Romania, also known under the title, "Fir-ai sa fii mai baiete". The drinking song with its ribald and comical story lyrics presumably originates from the Lautari's repertoire of in the suburbs of Bucharest. A vibrant hora from the south of Romania. The Jiu is a river in the Gorj region. The last verse reveals that Leana, the wife of the "crafty farmer", Dinca Schileriu, dallies with another during his absence. Recorded in 1938 with Mitica Matsa's ensemble for Columbia in Bucharest. Probably a newer song from Muntenia, played to a hora rhythm and which originated at the start of the 20th century. It was sung if the men were drafted into the army. A song whose lyrics remain very close to the original and has been little revised. Maria Tanase picked up this song in a beer garden in the suburb of Caramidari. The pub was called "La Malaieru" and was located close to her father's nursery. This song is made up from two different and unrelated subjects, a practice which was definitely a common occurrence in folk-songs. It presumably originates from central Transylvania. Cluj is the most important town in Transylvania. Recorded in 1939 with Constantin Bugeanu's ensemble for Columbia in Bucharest. Song in the Lautari style. Lyrics: Alexandru Bébé, music: Alexandru Tomasiu. Recorded in 1936 with Mitica Matsa's ensemble for Columbia in Bucharest. Hardly anyone in Romania knows a plausible answer to the question of why almost 40 years have had to pass since the death of the singer Maria Tanase, before CDs containing her songs appeared outside her native country. The Second World War, the iron curtain, her early death, there are many reasons to account for the fact that only insiders on the other side of the Balkans were aware of Maria Tanase until the end of the Nineties. 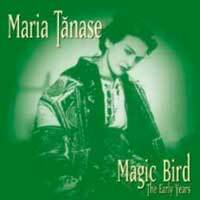 Maria Tanase never sang in Germany and she only saw it once, during an intermediate halt on the journey from Bucharest to New York, where, in the spring of 1939 at the world exhibition, she appeared in the Romanian pavilion together with Grigoras Dinicu's orchestra in front of an international audience with a repertoire of folk and suburban songs and won the hearts of American men by the dozen. The 25-year-old must have felt extremely troubled at that time, for in spite of her enthusiastically received appearances - some agents offered her concerts in the United States - and to the surprise of her colleagues she left the New York metropolis after just a few weeks and travelled back to Bucharest, to the city to which she would return time and again. War was just around the corner and in her homeland the frequency of verbal and violent assaults on many of her democratically-minded Jewish friends was on the increase. The family home of Maria Tanase was located in the Bucharest suburb of Caramidari. Here, at the beginning of the last century Ion Coanda and Ana Tanase ran a horticultural nursery, and it was here that Maria Tanase, as the third and initially unwanted child, first saw the light of day in September 1913. Even as an adolescent Maria Tanase sought out work in a city centre bar and met the young theatre director, Sandu Eliad. By his side she immersed herself in the heart of the rapidly growing Romanian metropolis, which in the Thirties became known as the "Paris of the East" on account of its chic bars and restaurants. The very young and attractive Maria Tanase became an idolised figure in the city salons, for it was impossible to ignore the fact that this girl from the suburbs possessed a strong feeling for the old songs, which she first of all sang amongst her friends and then many times later in the recording studios of Lifa and Columbia. With her unaffected interpretations and her warm alto voice Maria Tanase hit upon the yearning of her intellectual friends for another, unspoilt Romania which was increasingly becoming devoid of any meaning during the period between the wars. This rural, apparently intact Romania had survived in the villages and in folk-songs. Tanase, a new interpreter of these old songs, was celebrated as a great discovery. The photograph of the suburban rose, who was blooming in the salons, did the rounds of the press at the same time as the words of the "Magic Bird", who gave the Romanian folk-song a new lease of life, were also gaining currency. But what kind of woman was Maria Tanase? She was extremely curious, very elegant and occasionally extravagant. She spoke her mind freely in discussions, had a good sense of humour and could sometimes drive sound technicians to despair with her directness. Many who knew her remember her fantastic quick-wittedness. At the same time Maria Tanase had never undergone any special musical training, she was self-taught and a woman with extraordinary intuition. And although as an artist she was very much in demand and received high royalties, she still never had any money. She was always handing out her money in all directions and without any hesitation could give her fee for a whole day's work in the studio at Electrecord to one of her musicians who had to provide for a sick child at home - and afterwards borrow money for a taxi home.